An earlier version of this article identified ARC as playing Lassen Community College in the caption. In fact, the game shown in the picture was against Hartnell College. 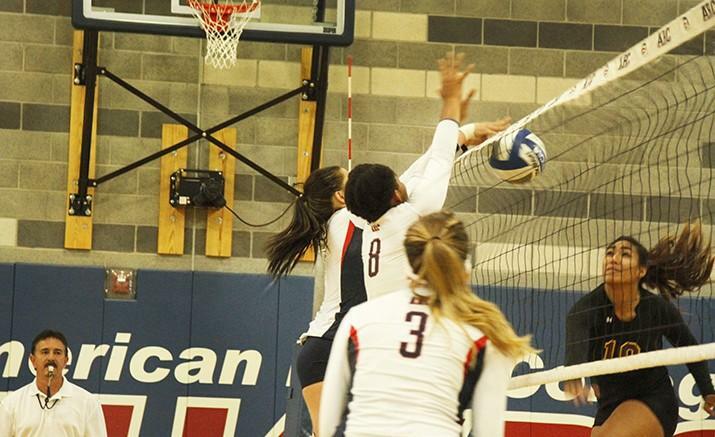 American River College’s volleyball team outlasted Hartnell College in its season opener with a final score of 3-2 in a match where Hartnell started and finished out of sync. ARC jumped out to a 5-1 lead in the first game as Hartnell came out flat and struggled with consistency throughout the match. Early in the first game, Hartnell often struggled to get the ball over the net when serving with ARC showing a more polished power game. “I had some ups and downs, but I pushed through and as a team we pushed through,” said sophomore middle blocker Erianna Williams, whose power game was instrumental in ARC’s win. Despite Hartnell gaining some late momentum, ARC was still able to hold on to win 25-11. In the second game, ARC led 7-6 but the lead quickly dissolved as Hartnell scored five unanswered points to take a 13-8 lead that it would not relinquish, winning 25-14. After an unexplained delay early in the third game, the game had several lead changes and neither team seized control until Hartnell went up 9-6. ARC eventually took a 17-16 lead but Hartnell roared back and won the game 25-20. Game four was another back and forth affair, with the two teams exchanging points until the game was even at 19. Hartnell ripped off six straight points to win the game and send the match to a deciding fifth game. Hartnell took the early lead, and despite another close game, ARC pulled out the win largely due to the play of Williams. Despite the win, freshman outside hitter Nora Troppmann said she believes the team has a long way to go. “We played well as a team but still have skills to work on as a team,” said Troppmann. Freshman outside hitter Katie Herrington said she has high expectations for this year’s squad. With this win, and the win over Lassen, ARC starts its season 2-0. ARC’s next game is at Foothill College on Sept. 4 at 2 p.m.
Johnnie Heard is a second-semester student on the Current, where he serves as the opinion editor. Johnnie is majoring in journalism and plans to transfer to Sacramento State. Be the first to comment on "ARC outlasts Hartnell 3-2 in come-from-behind win"